The Social Security Administration cannot start sending out letters to employers next week that carry with them more serious penalties for knowingly hiring illegal immigrants, a federal judge ruled Friday. Ruling on a lawsuit by the nation's largest federation of labor unions, U.S. District Judge Maxine Chesney granted a temporary restraining order prohibiting the so-called "no-match" letters from going out as planned starting Tuesday. The crash happened about 4:30 a.m. Friday at the Social Security office at 491 N. 500 West. The car backed through the front doors, crashing into furniture and interior walls, police said. Officers found the 45-year-old driver unconscious in the car. Police said the damage may have been intentional and the motorist was under the influence of alcohol or drugs. Officers took her to a hospital for evaluation then booked her into the Utah county jail on suspicion of criminal mischief and driving under the influence. For the first time in nearly a decade, the executive branch this past spring opened a register to applications for administrative law judge positions. Within three days of posting the announcement on the government jobs Web site, the opening closed, having drawn a targeted 1,250 applicants. Was it long pent-up demand or something not quite proper that prompted the application onslaught? "There is a sense of antagonism between [the Office of Personnel Management] and ALJs, at least from the ALJs' view," said a longtime ALJ. "They see an institution historically required to manage and protect ALJs, which now is really doing neither or not doing it very well." The indictment says Bowman falsely claimed she lived alone, or only with her child, when she was living with her common-law husband or boyfriend. It also alleges Bowman claimed that no other person paid for her food, rent, taxes and utilities, when her boyfriend paid some or all of the bills, the indictment alleges. The Social Security Administration has released the latest edition of the Social Security Bulletin. The Social Security Bulletin mostly contains statistical information and articles about statistical research on Social Security issues. The United States and Denmark have signed a Social Security totalization agreement, according to an announcement from the U.S. Social Security Administration. The press announcement on this touts the fact that the agreement will eliminate double taxation, but it also allows workers to combine wage credits from both countries to obtain Social Security benefits. Note that this totalization agreement is totally non-controversial, while the totalization agreement with Mexico has been totally controversial. Critics of the agreement with Mexico would point to the large number of Mexican citizens in the United States illegally as the reason for the different reception of the two agreements. Critics of those critics would point to the differences in skin hue between citizens of Denmark and Mexico as being the real reason. However, the two agreements are quite similar. If one objects vehemently to the agreement with Mexico, one should also object vehemently to the agreement with Denmark. Social Security has issued its monthly statistical summary for Title II and Title XVI of the Social Security Act. Eric Schnaufer has been kind enough to post elsewhere a document that states the position of Social Security's Office of General Counsel (at least for the 4th Circuit area) on payment issues under the Equal Access to Justice Act (EAJA). Claimants may obtain reimbursement for their attorney fees under EAJA for federal court cases in which they prevail. There have recently been serious issues about how EAJA fees are paid that have caused confusion and irritation to attorneys who represent Social Security claimants in federal court. On July 23, 2007, the House passed H.R. 404, the Federal Customer Service Enhancement Act. On July 24, 2007, the bill was received in the Senate and referred to the Committee on Homeland Security and Governmental Affairs. Among other provisions, the legislation would require the establishment of customer service standards for Federal agencies, including SSA. • Require the Comptroller General to report on each agency's customer service performance no later than two years after enactment. The report could be used by Congress as well as the Director of OMB to update performance measures for customer service. Compliance with customer service standards would, to the extent practicable, be an element of each agency's performance appraisal system. For five years Olivia Avila worked under a false name and bogus Social Security number at the National Beef meatpacking plant in Liberal to support her family. She kept working there after obtaining legal residency two years ago. But it was not until she went into the Social Security Administration to get credit for her earlier wages as an undocumented worker that her legal problems began — even though a loophole in federal law allows lawful immigrants to claim both legally and illegally earned wages in determining Social Security benefit eligibility. Avila, 51, was arrested at her job in June on six immigration-related counts after her visit to the Social Security Administration office in Wichita. Avila is now out on bond while awaiting her Oct. 16 trial on charges of using false documents to work in the United States and aggravated identity theft. ... At least two such recent immigration cases involving legal residents are now being prosecuted by the U.S. Attorney's Office in , although such prosecutions remain relatively rare. Fewer than 10 cases involving legal immigrants claiming Social Security benefits for past illegal earnings were filed within the last couple of years in Kansas. ... Jonathan Lasher, spokesman for the Social Security Administration's Office of Inspector General, said such crimes are a "separate issue" from benefit eligibility. ... "The law currently does allow that if someone gains legal status so that they now have a Social Security number that is legal, and they are authorized to work in the United States, the law does allow them to go back and get credit for any earnings they may have," said Mark Lassiter, spokesman for the Social Security Administration. Why Did This Case Have To Go To The Court Of Appeals? Florine Costello visited her local Social Security office in 1994 with a straightforward question: from which of her two ex-husbands could she collect the largest monthly benefit check? (Divorcees can draw retirement benefits on their former spouses’ earnings records. 42 U.S.C. §402(b).) Based on the advice she received, she applied for (and received) benefits for which, it turns out, she was ineligible. The SSA eventually discovered the error and demanded repayment of eight years’ benefits. Costello seeks to offset this amount by the benefits she would have received had she applied under the other ex-husband’s account. An administrative law judge concluded that such an offset is unavailable because the situation does not fall within 42 U.S.C. §402’s “misinformation” provision, which allows applications to be granted retroactively in some circumstances. After the Appeals Council declined Costello’s request for review, she brought this suit, in which the district court granted summary judgment for the agency. The Seventh Circuit Court of Appeals, in a decision by Judge Easterbrook reversed and allowed Ms. Costello the offset she requested. I have a hard time understanding how the Administrative Law Judge, Appeals Council and District Court all ruled against Mrs. Costello. As described, her case is extremely sympathetic. In addition to the theory Mrs. Costello used, there is at least one other theory that could have been used (and maybe it was used, but was not an issue presented to the Court of Appeals), a theory which I find more compelling than the one used. When Mrs. Costello filed that claim for survivor's benefits, the claim form said that she was applying for all benefits under Title II of the Social Security Act to which she might be eligible. That is what all Title II claim forms say and that language is there for a reason -- to take care of cases in which, by mistake, the wrong claim is taken, which happens to be exactly Mrs Costello's situation. There is nothing in this language that limits the claim to the Social Security number listed on the claim form. Therefore, Mrs. Costello did file a claim for benefits on the account under which she was eligible and has no need to establish the claim filing date based upon misinformation. Also, Mrs. Costello should have been granted waiver of the overpayment if she had asked. Obviously, she was without fault and probably has nowhere near enough money to repay. In any case, it would be against equity and good conscience to ask her to repay under these circumstances, which would make her financial status irrelevant. The Bush administration is preparing a legislative proposal to present to Congress in September that would establish a separate and, under most circumstances, a more generous disability package for service members who are injured in war or while training for war, sources said. Under the plan, recommended by the Dole-Shalala commission, service members found unfit for duty as a result of combat or combat-training injuries, regardless of the number of years served, would qualify for an immediate lifetime annuity from the Department of Defense. I mention this because a number of people have been saying recently that those who are approved for 100% service connected VA benefits should be automatically eligible for Social Security disability benefits. I cannot say whether this will ever happen, but this legislation would be a convenient vehicle to carry such a change forward. The article in today's Charlotte Observer concerning backlogs in the Charlotte, NC hearing office may not be the only article along these lines to expect. The Charlotte Observer article indicates that the reporter collected data on individual Administrative Law Judge (ALJ) productivity (and I know that he collected information on ALJ reversal rates as well) from all of Social Security's hearing offices in the Carolinas (and by the way, as a North Carolinian, let me make it clear that there is no geographic entity which may properly be referred to as "Carolina" -- the reference should always be to the Carolinas). The Charlotte Observer is part of the McClatchy chain of newspapers. McClatchy also owns newspapers in Raleigh, NC, Rock Hill, SC, Columbia, SC, Myrtle Beach, SC, Beaufort, SC and Bluffton, SC. There may well be a series of articles in these other newspapers having to do with productivity and reversal rates of ALJs in the other hearing offices in the Carolinas. One million people by 2010. 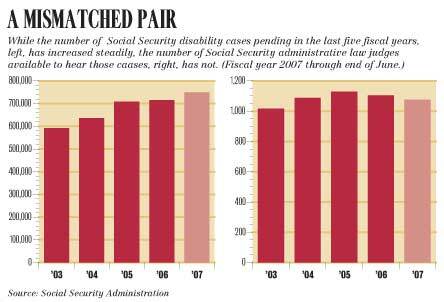 That's the estimated backlog of pending cases for Social Security Disability Insurance benefits. To handle that increase, due largely in part to the aging of baby boomers, the approval and appeals process must be altered. The Social Security Administration is making an effort to screen and prioritize cases that are or will be 1,000 days old by the end of September. That's a start. But those are just bare minimums. Implementing those things won't be enough to address the growing backlog, currently at 745,000 cases. Change is needed immediately. Congress and SSA officials must act or the future of the country's disabled population will grow even bleaker. Why is it that "the appeals process must be altered?" Why not just give the agency adequate resources? Social Security's backlogs seem to produce a knee jerk response of a desire to alter or reform the process. However, Social Security is suffering from an overdose of alterations and reform that well meaning people proposed as a means to avoid the need for additional resources. These schemes have only had a negative effect upon productivity while wasting valuable resources and time. Social Security will never alter or reform its way out of this hole. People who ask for alterations or reform in the process are part of the problem. Talk of reform is merely a distraction. In one case, a Gastonia man took his own life. • Charlotte judges, on average, decided fewer cases than judges in other offices in the Carolinas: 375 cases per judge last year, compared with a combined average of 427 at offices in Greensboro, Raleigh, Columbia, Charleston and Greenville, S.C.
• At any given time, half of the six courtrooms at the Charlotte hearing office are not in use. The Observer spent about 40 hours monitoring the office this month. Around 3 p.m. on a Friday, an office worker observed an empty waiting area when an applicant failed to show up. She said to no one in particular, "We might as well go home." The office closes at 4:30, but lawyers for applicants say hearings are rarely scheduled after 3 p.m. Judge Dennis Dugan issued 188 rulings last year, the fewest among judges in the Charlotte office. Frye, Kevin Foley, Ronald Osborn and Robert Egan also issued fewer than 400 decisions. Saul Nathanson issued the most with 484. Plan for Achieving Self-Support, PASS, is a federal program allowing recipients of SSI and SSDI to set aside money to achieve certain work goals. Under SSI, any outside income reduces your benefit. But if you qualify for PASS, Social Security will not count that new income against your monthly benefit. My experience is that PASS is almost worthless because of multiple restrictions on how it can be used and because Social Security cannot make PASS decisions on a timely basis. Social Security employees seem almost rightened of approving a PASS application. 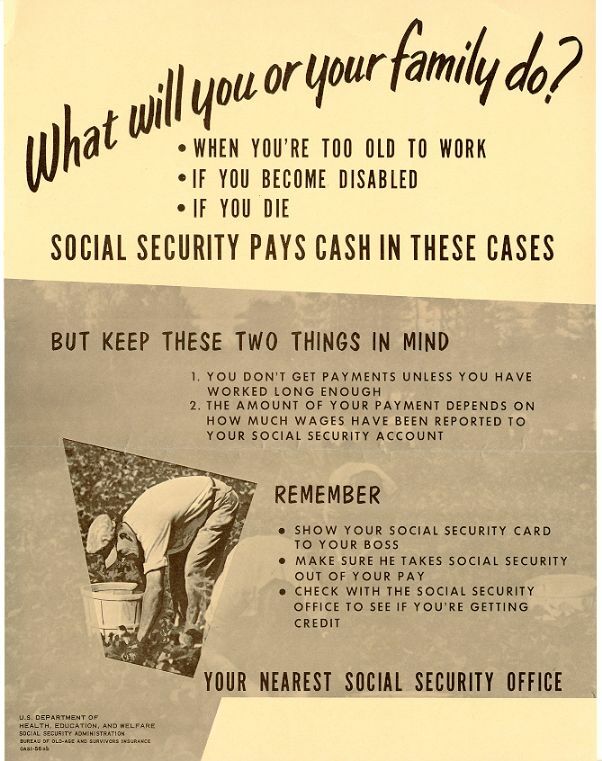 There seems to be much sentiment at Social Security that if you can even think about working, you should not be on Social Security disability benefits and any statutes or regulations suggesting otherwise must be interpreted against the claimant or ignored. New "no-match" rules require that employers must fire workers when they are unable to resolve discrepancies between the name under which they have been working and the Social Security number under which they have been working. What effect do you expect this change to have upon Social Security field office workloads? John Johnson left the U.S. Army with such physical and mental scars, the U.S. Department of Veterans Affairs rated him 100 percent disabled in 2003. As of the end of July, 14,707 cases were waiting for an appeals hearing at the Buffalo office. Close to 8,000 had been pending for more than a year. There are currently 13 judges working out of the Buffalo office. Social Security Administration spokesman John Shallman says that an additional administrative law judge should be added there in October. While waiting for his Social Security disability claim to be processed, Mark Reser’s children went without Christmas. Judge Frank Cristaudo, SSA chief administrative law judge, says the agency knows the backlogs are a problem. Kansas had an accuracy rate that was greater than 95 percent in dealing with the initial claims. “On the front end, we do really well,” SRS spokeswoman Abbie Hodgson said. Even with a $2 trillion trust fund for its budget, the Social Security Administration is in serious jeopardy, facing increasing backlogs as it processes more claims with fewer employees. Richard Warsinskey, manager of the administration's Cleveland office, says he is as frustrated as those who wait for hours in an office or get a recording when they call for help with retirement benefits, survivor or disability benefits or Supplemental Security Income. Disability claims take more than half our resources. But we will see a growth in retirement next year as the first of baby boomers turn 62 and are in their first year of eligibility. Why the backlog in disability claims? What could further overwhelm your staff? We are concerned about proposed immigration rules. Currently when someone is hired, their information is sent to Social Security and we check the Social Security number. If it doesn't match, we send it back to the employer. They weren't obligated to do anything but may be required to send the employee to SSA to straighten it out. KFVR-TV, located in a city named after the German Chancellor, is running a story on current Social Security backlogs. If this story has reached Bismark, North Dakota, it is truly a national story. I cannot help recalling a little history. 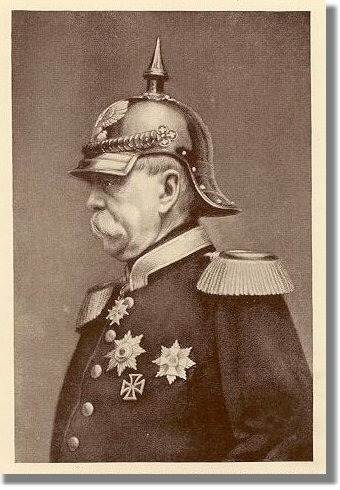 The true father of Social Security is not Franklin Roosevelt but Otto von Bismark. (Take a look at some history about Bismark and Social Security.) By the time Social Security reached the United States, Social Security had already been in effect in Germany for 46 years. Conservatives who predict that Social Security will soon run out of money may consider why Bismark, no liberal, is the true father of Social Security and how Social Security has managed to last 118 years in Germany despite German losses in two World Wars, an incredible episode of hyperinflation between the two World Wars, the Cold War and the eventual reunification of Germany. A week after unveiling a major crackdown on businesses that hire illegal immigrants, the Bush administration is now conceding that its most heavily touted weapon in pursuing employers - an assault against Social Security fraud - will be nearly useless. That's because when the Social Security Administration warns employers about bogus identification numbers, it remains barred from also alerting the Department of Homeland Security, the agency that's supposed to hand out penalties. In addition, federal promises to hold companies responsible for hiring illegal immigrants could potentially be stymied by several other issues: Employers are still not required to check a new employee's Social Security number against a free federal database, there could be long gaps between when an employee is hired to when the warnings are issued each year, and there is no way to follow up on employees who have been fired. In many cases, illegal workers could still hop from job to job without being caught. The only way the government can punish an employer - with fines or criminal charges - is if someone first tips them off about potential fraud and then, during the course of the investigation, authorities discover evidence that Social Security warnings have been ignore. Paying out certain types of government aid in a monthly lump sum appears to fuel a spate of harmful and often fatal drug binges, according to a new study in a forthcoming issue of the Journal of Public Economics that links the monthly arrival of disability checks with a sharp rise in drug related hospitalizations and deaths. The findings by researchers at the University of California, Santa Cruz and Texas A&M University suggests that spreading out aid payments over several weeks could be a way to relieve some of the stress on hospitals and health care workers who struggle to handle the monthly surge. The analysis found that in California, the 23 percent increase in drug-related hospital admissions that occurs in the first five days of any given month is driven largely by the arrival of Supplemental Security Income (SSI) and Social Security Disability Income (DI) payments. In particular, hospital deaths among SSI recipients increase 22 percent at the beginning of the month. The Social Security Administration (SSA) has awarded a large contract to Micro Tech LLC according to the Baltimore Business Journal. The contract is to provide "mainframe systems engineering and administration and telecommunications and Internet support services" to Social Security's National Computing Center in Baltimore. The initial contract is only for one year, but may be extended for four more years. If extended, the contract would be worth $80 million. EDS (Ross Perot's company), Apptis and Open Technology Group are also involved in the contract. More than three dozen House members on Aug. 2 sent a letter to the Social Security Administration asking the agency to clarify that Medicare does not cover long-term care, CQ HealthBeat reports. The bipartisan letter urges SSA Commissioner Michael Astrue to include in Social Security statements sent annually to 143 million U.S. residents the sentence: "Medicare generally does not pay for long-term care." The statement currently says that Medicare provides some coverage for "nursing care," which the lawmakers wrote "creates an unnecessary risk that individuals will assume Medicare covers an extended stay in a nursing home, when in fact it does not." The Social Security Administration has restarted the Senior Attorney program. Do you think this is a good idea? In our January 13, 2005 notice, we also announced that we would provide each applicant eligible to sit for the examination required by SSPA section 303(b)(4) a copy of the Compilation of Social Security Laws, Volume 1 (Compilation), to use as an open-book reference during the examination. Based on experience we have gained in the first four examinations, we have decided that providing a limited number of copies of the Compilation at each testing site for test-takers to consult during the examination is sufficient. Therefore, instead of giving each test-taker a copy of the Compilation, we will make available at each testing site sufficient copies of the Compilation for use by test-takers during the examination. The Social Security Administration has published the updated numbers seen below on payments of fees to attorneys and others for representing claimants before the agency. Note that fee payments went up by 80% between January and June, but then went down 21% between June and July. To those who work at Social Security who think this means that attorneys who represent Social Security claimants took home 80% more in June than in January and then 21% less in July, which is itself a huge variation, think again. Those who represent claimants usually have substantial office expenses. These office expenses are a fixed "nut" that change little from month to month. The practical effect of this is that the net profit (or loss) of someone who represents Social Security claimants for a living swings far more wildly from month to month than one might think from reading Social Security's numbers. These fluctuations which seem dramatic even on the surface are far more dramatic for those on the receiving end. It is a wild ride. Human services advocates were briefed by Senate Appropriations staff on the FY 2008 Departments of Labor, Health and Human Services and Education (L-HHS-ED) Appropriations bill. It appears likely that Senate Majority Leader Reid (D-NV) will not schedule the L-HHS-ED bill for floor action in September. The September calendar is too crammed with “must do” legislation. Thus, the House-passed L-HHS-ED bill will be conferenced with the bill adopted by the Senate Appropriations Committee. This bill will ultimately be included in an omnibus bill where several FY 2008 appropriations bills will be merged together. However, if this tactic plays out, a Presidential veto looms, practically assuring the start of Fiscal Year 2008 without an enacted bill on L-HHS-ED appropriations. Funding will most likely continue under one or more short term Continuing Resolutions until the White House and the Congress agree on spending levels. The Social Security Administration has published a Notice of Proposed Rule Making (NPRM) that would suspend new cases going into the Federal Reviewing Officer (FedRO) program. Those 15,500 cases already in the FedRO system would stay in that system. The projected cost savings from this are $907 million over the next ten years. This is not immediately effective. Comments may be filed on the NPRM for the next month. Probably, the proposed rules will be quickly adopted thereafter. Until then, apparently, new cases will continue to go into the FedRO program. There is no word on what will happen to those unfortunates who took jobs as FedROs. Comments are also requested on what to do with the Medical and Vocation Expert System that is a part of the Disability Service Improvement (DSI) plan. Thus, about six months after taking office, Commissioner Michael Astrue is effectively labeling the greatly heralded DSI plan of his predecessor, Jo Anne Barnhart, a failure and is abandoning it. Is this a decent interval? Attorney to do Social Security appeals work for Raleigh, NC law firm. Significant Social Security experience required. Experience with Appeals Council and District Court work would be a big plus. Good writing skills essential. Being licensed in NC or eligible for admission to NC bar by comity a plus, but not essential. Send resume and writing sample to Charles T. Hall. E-mail to charles[@]charleshallfirm.com or fax to 919-791-1886. We propose to recognize one-stop delivery systems established under the program of the U.S. Department of Labor under subtitle B of title I of the Workforce Investment Act of 1998 as qualified ENs. A few days ago Lizzie Jones of Buffalo was visited by three men who claimed they were from the government. Lizzie Jones, Buffalo Resident: "We're from Social Security and we want to make sure the people are getting their social security check." Lizzie said she gave them personal information including her social security number because they showed her identification. Lizie Jones: "He did it real fast. He did it so fast I couldn't see it really." But Lizzie's grandson Avery was suspcious. After the men left he had his mom call Social Security. Avery Hutchenson, Lizzie's Grandson: "They don't send anyone door to door and they did not send anyone in this area during that day." The Social Security Advisory Board (SSAB) has issued the following agenda for its next meeting. It is nice to see them putting this out well before the meeting. The Deficit Reduction Act of 2005 (DRA) contained items that modified Social Security law, particularly in regard to the payment of back SSI benefits. The DRA has been controversial because it was not passed by the two houses of Congress in exactly the same form. The most prominent litigation on this has been Public Citizen v. Clerk, U.S. District Court. The DRA has been upheld by the District Court, 451 F.Supp. 2d 109 (D.D.C. 2006) and the Court of Appeals, 486 F.3d 1342 (D.C. 2007). Public Citizen has now filed a petition for certiorari with the Supreme Court. Although this litigation has gotten short shrift so far, it is of basic constitutional importance and cert may well be granted. Employers need a system they can rely on to determine the legal status of potential workers, so Graham said he plans to introduce a bill this fall to replace all Social Security cards over the next 10 years at a cost of $8 billion to $10 billion. The new cards would be tamperproof. SPOKANE -- Eight years after a judge declared him dead, the Social Security Administration says Judy Sullivan's husband is alive, and it wants back more than $90,000 in survivor's benefits she has received. Meanwhile, the legal clinic [representing Mrs. Sullivan] has asked for a waiver of the benefits "overpayment" until the matter can be resolved. Allen Gilbert, an official of the agency's Spokane office, told The Spokesman-Review the chances of the waiver being approved are good because Sullivan applied for and received the benefit money in good faith. The Selners [who are waiting and waiting for a Social Security disability hearing] are in a very long line. They're among 24,000 Indiana families still waiting to appeal their case to an administrative law judge. In fact, Indiana has one of the biggest backlogs in the country. Advocacy groups for the disabled ranked Indiana as seventh worst when it comes to delays in getting an appeal hearing. Michigan is fourth. "I don't think I would characterize it is a crisis, but it is something we are extremely, extremely concerned about,” said Robert Walsh, spokesperson for the Social Security Administration. Would this look like a crisis to Robert Walsh if it was his family? The U.S. Custom and Immigration Enforcement issued rules yesterday that will require employers to fire workers whose names and Social Security numbers do not match. The Social Security Administration has been sending no-match letters to employers for years, but there was no punishment for ignoring the letters. Now, there will be punishment if employers ignore the no-match letters. Greg Siskind, an immigration attorney, has posted in his blog a useful list of frequently asked questions about these new rules. For those interested in the effects of these new rules upon the Social Security Administration, the key points are that these new rules are effective on September 9, 2007 and that there are serious penalties if employers ignore no-match letters. These new regulations add a new and unpredictable workload to Social Security's field offices, as many who have failed to notify the Social Security Administration of name changes are forced to contact Social Security. SSA is in the planning stage of developing the Agency's second phase of the fee-based web service system which would provide private industry and other third party requesters with disability and retirement data (including insured status information, dates of entitlement, and benefit amounts). 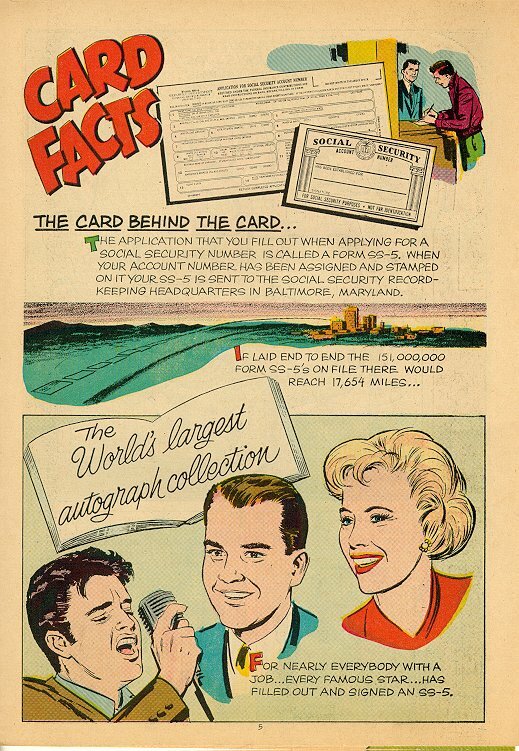 [The first phase was simple Social Security number verification.] This process, the Consent Based Benefit Information System (CBBI), would assist private insurance or pension benefit companies to determine private entitlements and coordinate entitlement to such benefits. These actions help the requesters to reduce and/or eliminate the overpayment of these benefits to their insured clients. Similar to the CBSV process, companies would be required to enter into a legal agreement with SSA, obtain written consent from the record holder, reimburse SSA, and follow SSA's established systems security and audit guidelines. Social Security's Office of Policy has released OASDI [Old Age, Survivors and Disability Insurance] Beneficiaries by State and County, 2006, which lists the number of persons receiving various types of Social Security benefits in each county in the United States. The Social Security Administration has issued final rules on the extension of withholding of fees for representing Social Security claimants to SSI cases and to some non-attorney representatives of claimants. This replaces "interim final rules" that had published on April 5, 2007. ... we are permitting attorney advisors, under managerial oversight, to conduct certain prehearing proceedings to help develop claims, and issue fully favorable decisions in appropriate claims before a hearing is conducted. We expect that this change will help us reduce the very high number of pending cases at the hearing level by enhancing claims development before the hearing and by permitting attorney advisors to issue fully favorable decisions in appropriate claims. The Senior Attorney program was in effect some years ago and was quite helpful in reducing a much smaller backlog at that time. The new regulations put a two year limit on the Senior Attorney program, although the regulation states that this time could be shortened or lengthened. It is most unlikely that Social Security will work off its hearing backlog in the next two years. Each day the Office of Federal Register posts brief summaries of items they have received for publication in the Federal Register the next day. Here are two interesting items from Social Security that just showed up on this list. I know no more than I can glean from this bare description, but the first one sounds like senior attorney decisions. WASHINGTON -- The Social Security Administration should make a clear, strategic commitment to upgrading its online services for an increasingly Internet-savvy clientele, says a new report from the National Research Council. Although SSA's present computer and database systems continue to operate and do not jeopardize the current delivery of benefits, enhancing online service offerings and maintaining the systems will become increasingly difficult without significant changes. The SSA developed an "e-government" strategy in accordance with the President's E-Gov Initiative and asked the Research Council to form a committee to review the strategy. The committee found that although SSA offers some online services, it does not strongly promote use of the Internet as an alternative to its traditional methods of customer service. The online services SSA does offer lag behind those offered by private financial institutions, and the agency has not kept pace with technological improvements supporting electronic services, the report adds. SSA has a long-standing tradition of individualized customer service delivered in person or over the phone, which is very labor intensive. However, the new wave of baby boomer clients for SSA benefits and services, unlike previous generations, is more comfortable with computers and electronic commerce. The report recommends that SSA follow the example of large firms that have successfully rolled out electronic services by giving a high-level office responsibility for developing and managing electronic information and service delivery. To be successful in developing and upgrading its electronic services, the SSA also needs to undergo a shift in organizational culture toward embracing change -- by regularly evaluating emerging trends in technology, business practices, demographics, and public expectations -- as a constant factor in how it does business. Because the underlying databases are essential to delivery of electronic services, the report also examines SSA's plans to update its more than 20-year-old "MADAM" database system, which is well-behind current commercial technology, and which has not been replaced despite warnings from as far back as 1986 about the risks of maintaining it. This obsolete, custom technology requires highly specialized expertise that is in increasingly short supply. SSA personnel with this expertise will begin retiring in greater numbers and replacing them will be difficult because the required skills are no longer in the mainstream. Moreover, it is much easier to implement electronic services with a modern database system. The report recommends that SSA give considerable weight to the efficacy of electronic delivery of services and remain open to the incorporation of new technologies when planning for conversion and upgrade. Because modernization of MADAM is critical to the SSA's mission, and because the committee has concerns about SSA's current plans for updating MADAM, the committee also recommended seeking technical advice from a broader range of experts in undertaking a conversion. SSA's approach to balancing risks and rewards for modernization is overly cautious, the committee concluded. It recommended a more appropriate balance that better recognizes the risks associated with failing to modernize and the benefits of modernization such as cost reduction, fraud prevention, and customer satisfaction. I think I can tell the National Research Council why Social Security does not promote its online services more. It is because they do not work very well. So far, most people find them frustrating to use and there is little or no savings to the agency when they do. Of course with enough money, Social Security might be able to make its online services work better, but since Social Security was struggling just to keep its doors open a few months ago, enough money to greatly upgrade the agency's online capacity may be a pipe dream at this point. Disabled by an enlarged heart and unable to work, welder David Olson, 54, waited almost two years to be approved for Social Security disability payments. In July, he was found dead in his recliner at his Montana home. His sister, Nancy Olson, 53, of Milwaukee, fears help might come too late for her, as well. She is on continuous oxygen because of a rare lung disease caused by inhaling microscopic spores of a fungus. The situation is acute in Milwaukee and getting worse. Last month, 10,956 people were waiting for a hearing to determine whether they qualify for the benefit. That's up about 19% since September 2005 and a historic high, according to records obtained by the Journal Sentinel. The Milwaukee Office of Disability Adjudication and Review, where the hearings are held, is also well above the national average in the number of days it takes to process a case. In July, the national average was 528 days, and in Milwaukee, the average was 651 days. "It's horrible," said U.S. Rep. Paul Ryan (R-Wis.), a member of the House Ways and Means subcommittee that oversees the Social Security Administration. "No doubt about it, this is a crisis." On July 25, 2007, the Senate amended and then passed by unanimous consent H.R. 1538, the Dignified Treatment of Wounded Warriors Act. When the House takes up the Senate-passed version, it will either accept the Senate amendments and clear the bill for the President, or disagree with the Senate-passed version and request a conference to resolve the differences. • Would require the Department of Defense to develop and maintain a comprehensive handbook that describes the compensation and other benefits to which a service member and that member's family would be entitled upon the member's separation or retirement from the Armed Forces as a result of a serious injury or illness. In developing and maintaining this handbook, the Department of Defense would be required to consult with the Social Security Administration, the Department of Veterans Affairs and the Department of Health and Human Services. The provision would be effective upon enactment. Rick [Warsinskey, NCSSMA President] spoke with Roger McDonnell [Social Security's Associate Commissioner for the Office of Public Services and Operations Support] regarding [backlogs in PC 7, which is part of the Office of Central Operations] this morning. Roger is aware that the backlogs are growing and that processing time is increasing. He has talked with Carolyn Simmons [Associate Commissioner for the Office of Central Operations] in the last month about these issues. He would like NCSSMA to share some feedback with Carolyn Simmons. Rick wants to establish a way to communicate to the module managers when there are problems. The Executive Committee discussed the issue. Some reported success by getting assistance from their Regional Offices after two attempts without success. Others reported frustration even at the Deputy Director level at PC 7. Many agreed that there are some modules in PC 7 that are very responsive and “customer” focused and that there are others that are very difficult to deal with. Mr. Astrue’s desire for better communications with the Union is not mirrored by his subordinates. The Deputy Commissioner for Operations Linda McMahon and all Regional Commissioners (RCs) refuse to meet with employee-elected representa-tives. They make decisions without employee input. Television station WBKO of Bowling Green, KY is running a story entitled "Red Tape and Disabilities" on Social Security's disability adjudication backlogs. See it in streaming video. Employers across the country may have to fire workers with questionable Social Security numbers to avoid getting snagged in a Bush administration crackdown on illegal immigrants. The Department of Homeland Security is expected to make public soon new rules for employers notified when a worker's name or Social Security number is flagged by the Social Security Administration. The rule as drafted requires employers to fire people who can't be verified as a legal worker and can't resolve within 60 days why the name or Social Security number on their W-2 doesn't match the government's database. Employers who don't comply could face fines of $250 to $10,000 per illegal worker and incident. The natural thought is of illegal immigrants working under phony Social Security numbers and there will be plenty of those cases. However, there may be millions of other cases involving U.S. citizens where the records are simply incomplete or inaccurate. There are many women who changed their names when they married or divorced, but never told the Social Security Administration. Social Security employees will have to resolve these cases -- and in short order. Potentially, this is a huge workload, for which the Social Security Administration is ill-prepared. Social Security has created a new web page and a new pamphlet for "wounded warriors." Social Security promises expedited review of the claims of those who became disabled while in military service regardless of whether the disability is the result of combat or is any sort of wound. Would direct the Commissioner of Social Security to provide MSP and LIS applications to individuals who apply for Medicare benefits with SSA. SSA would also be required to provide assistance to beneficiaries in completing these MSP applications, which would be forwarded to the State Medicaid Agency for processing. This provision would be effective January 1, 2009. Would allow the Commissioner of Social Security to obtain certain adjusted gross income data including information on State, private or individual pensions and annuities from IRS to identify beneficiaries potentially eligible for the LIS, effective upon enactment. To implement section 418 of the Social Security Protection Act of 2004 (SSPA), we propose to revise our regulations to explain that a State or local government worker will be subject to the Government Pension Offset (GPO) provision under title II of the Social Security Act (the Act), if any part of the last 60 months of government service was not covered by Social Security. We also propose to replace the words ‘‘receiving’’ and ‘‘received’’ with the word ‘‘payable’’ when referring to the eligibility to or payout from a government pension. This wording change will make the regulatory and statutory language consistent and help clarify when the GPO is applicable. In addition, we propose to revise our regulations to reflect a separate 60- month requirement that was made applicable to Federal employees by a 1987 law. This proposed regulation is not controversial, but the underlying statute remains controversial. I regret to announce that Dr. David Gray has resigned as Deputy Commissioner for Disability and Income Security Programs due to personal issues and he has returned to Washington University. I have continued to be impressed by his intelligence and thoughtfulness and believe that this hard decision is best for David and his family. I wish him well and I am sorry that we will not benefit from his talents and knowledge. During this time of transition, I have asked David Rust to serve as Acting Deputy Commissioner for Disability and Income Security Programs. Executive Secretariat matters should be referred to Gary Thorne until further notice. I would also like to thank Manny Vaz once again for his strong leadership during his tenure as Acting Deputy Commissioner for Disability and Income Security Programs in recent months. Astrue had just announced the hiring of David Gray on July 18! The U.S. Social Security Administration (SSA) has awarded a 10-year contract, valued up to US$300 million, for the SSA's Telephone Systems Replacement Project (TSRP) to a team led by Nortel Government Solutions*, a U.S. company wholly owned by Nortel* [NYSE/TSX: NT]. Mary Joanne Gludt, former chief of the disabilities litigation branch of the Social Security Administration, died July 19 of Alzheimer's disease at Genesis Elder Care Spa Creek Center in Annapolis. The former longtime Columbia resident was 70. Television station WCPO of Cincinnati is running a story on Social Security backlogs. You can watch online or read the text. 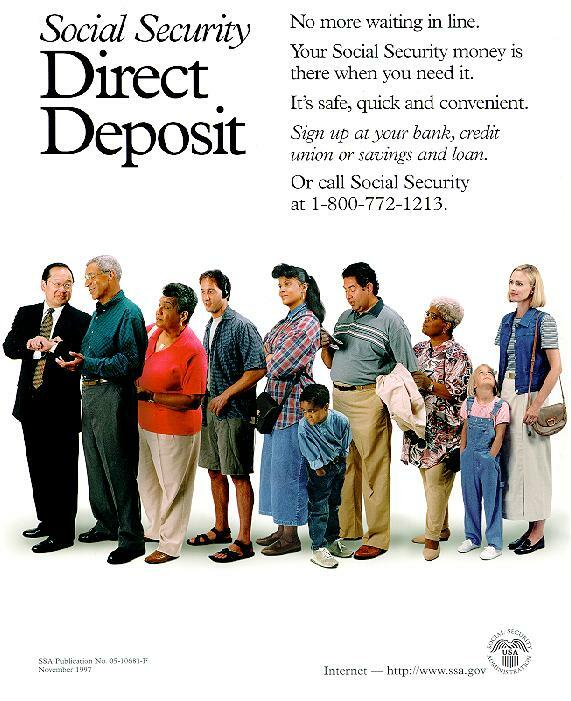 Radio station KSL of Salt Lake City, UT is running a story on Social Security's backlogs. There has been an explosion of stories along these lines since the USA Today article. It is impractical and pointless to link to all of them here. The USA Today article has to be the strongest publicity yet for Social Security's backlog and budget problems. When it comes to waiting for Social Security disability insurance benefit claims to be processed, New York state has a backlog bigger than the population of Troy. More than 52,000 people statewide have been waiting months or years for decisions on their applications, according to two groups that researched the problem. It's the 18th worst showing among the states in disability backlogs. Albany is in the district of Mike McNulty, the chairman of the House Social Security Subcommittee. "The Social Security crisis is already here today, manifesting itself first in the disability program," said Allsup, who was a claims and field representative for the agency before starting his company, which represents disability applicants. "They are a direct reflection of staffing problems that Social Security has." The rankings were also compiled by the American Association of People with Disabilities, the nation's largest cross-disability membership organizations. Andrew J. Imparato, president and CEO of the not-for-profit, said the wait is keeping seriously disabled Americans from getting insurance they paid for. I had earlier posted about the apparent alliance between Allsup and the American Association of People with Disabilities, which until this alliance seemed to have little interest in Social Security disability matters. Says [Stanford] Ross [a former Commissioner of Social Security], "The agency, I think, is whistling a little in the dark. They're saying, 'Well, if we get this, that and the other thing, we'll do the job. We always have. We'll be OK.' I don't think you'll wind up with the resources you're going to need unless you make your case clear. The beginning of getting the resources is being candid with the Congress and OMB and the President and the public about how deep and serious your problems are. "Clearly, the number of workers is inadequate for the workload, and, short term, there's no substitute for the number of workers. Longer term, maybe technology and different methods of doing business can substitute for bodies, but I don't think that's true in the short term," he says. "The public is going to be ill-served if these shortfalls in service delivery are not corrected, like, yesterday. It's not being well-served right now in some ways." This puts into better focus just how irresponsible former Commissioner Barnhart was. She was entering office about the time this was published and, undoubtedly, was made aware of the 2010 Vision report. Instead of vigorously pushing for increased staffing for Social Security, she promised that her "plan" would dramatically improve service at Social Security without any increase in personnel. Indeed, she seemed to have no objection as her agency's staffing was cut. Figures are as of end of 2006. Backlog figures not available for Alaska, Idaho, South Dakota, Vermont and Wyoming.